It can be quite easy to forget that we are actually living in quite a fragile way of life. Most people have power and electricity that feed directly into their homes, free-flowing water at their fingertips. There are grocery stores at almost every corner with everything they need in order to survive. However, with political unrest constantly raging in many countries across the globe, natural disasters occurring with increasing severity and frequency and the failing economy today, it is very evident that the system nowadays isn’t infallible. 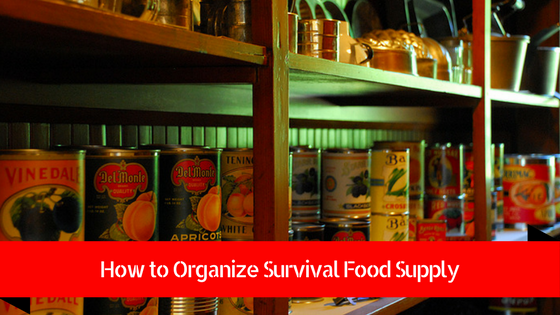 It is no surprise that many people are now getting educated on how to organize survival food supply. Being prepared for emergencies is much more important these days than ever before. You need to be prepared on your own to be sure that you and your loved ones are safe and will be taken care of in times of crisis. Thus, if you want to be able to meet you and your family’s needs, having sufficient emergency food by knowing how to organize survival food is the first essential step. So, why do you need to organize survival food when there are a lot of grocery shops where you can buy all you need to eat in order to survive? There are a lot of people who already know how to organize survival food for disasters, but there are still many others who think that their next meal could be easily bought in the market once a huge disaster occurs. In the US, when trucking is halted or delayed, goods and merchandise are delayed and a lot of establishments may close down. Many supplied would not also make it to the retailers and manufacturers. This will then result in consumers not being able to obtain the goods they need. If you want to have peace of mind knowing that whatever happens, you and your loved ones have food to survive, organizing survival food is of great importance. You will also have a sense of security knowing that you would not be caught without food and unprepared when emergencies or disasters occur. Therefore, it is an absolute must to understand how to organize survival food. Having survival food on hand enables you to sustain yourself and your loved ones in times of major crises. The Types of Survival Foods. There are different types of survival foods, and those that suit you and your family often depends on some important factors, such as your preference, storage space, budget and the types of food available in your area. The type of food you can include in your survival kit is usually dependent on what you normally eat. When it comes to storing survival food, it’s not really advisable to store grains. It is also important to consider the special cases in your home when planning on the foods to store, including the presence of infants or elderly who might need particular types of food and allergies to some types of food or ingredients. Label Everything. It can be easy to put a container in the freezer thinking that you will be able to identify it later, but when the time comes, you can’t even remember what that mystery package is and when did you place it in there. Even if it seems that they are easy to identify label it anyways. Label bags, buckets, and any unidentifiable containers, not only with expirations dates but also with cooking instructions. You can just write the instructions on a piece of paper or print them out and tuck them into the package or tape to the outside of the container. It is very handy to have them in your food storage package. Store the Items in the Right Spot. Although you don’t really want your survival foods to be used, you want to ensure that the food is at its optimum quality. One way to do this is to ensure that the place where the food is stored has a minimum exposure to air, moisture, heat and sunlight. 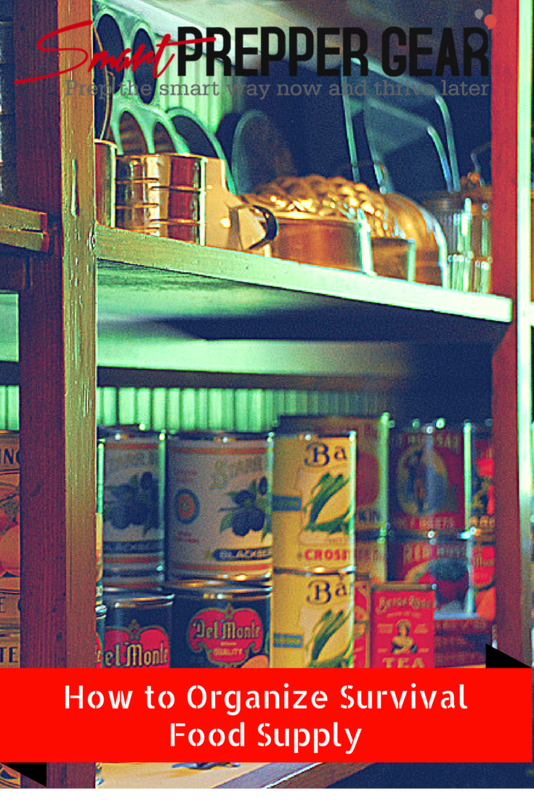 Goods that are stored in a dark area or room will last longer than those in the garage or pantry. twice as long as they restore at seventy degrees compared to those stores at ninety degrees. Keep in mind that temperature has the biggest effect on foods. Temperature can affect the taste, texture, and nutrition of the food. Moisture is also another consideration when storing foods. Look for a dry spot to keep food items. Also, avoid storing them next to particular products, like fuels or soaps. This is vital to prevent the spread of odor and some other potential contaminants. Rotate & Resupply. All items purchased for a long-term storage closet must be used, rotated and resupplied. This is a very important way to ensure that you have the freshest foods. When you organize food reserves, put the item with the earliest expiration date in front of the shelf so that it’s used first. You can also utilize a can rotation system to assist you in a FIFO (First In First Out) inventory method. It may be a good idea to conduct an inventory check every six months. This will ensure that preserves, canned goods, and other food storage items are within the expiration dates. Store Snacks with High Energy Ingredients to Enhance Energy Levels. When it comes to organizing food survival, you should not just include everything you want to eat. You must also pay great attention to the essence of each food item. Eating high-energy snacks and those that are high in protein will provide a guaranteed boost in energy. Include snacks that are high in protein and complex carbohydrates, such as granola bars, trail mix, and crackers. They can be stored for up to one year. They will keep your spirits and energy levels high in any emergency situation. Do not Forget a Good Supply of Water. Having enough supply of water in the home is actually more important than food. Everyone can go with without food but with water, you can only survive for three days. Perhaps, you won’t die but an individual who goes more than 1 day without water will surely be in an extremely bad shape. A lot of disaster organizations recommend having a 2-week supply of water to be stored up. This is equal to fourteen gallons of water for drinking only. Used bottles of soda or juice can be utilized to store extra water to use in case of a disaster. These can be frozen to be used at later times. One great option that I personally recommend is purchasing the Aqua-Tainer 7 Gallon Rigid Water Container. It might also be a good idea to have an additional water filtration system or pump. Never Forget the Basics. There are some essential staples that must be considered when organizing survival food. This includes baking soda, spices, sugar, salt, cooking oil, vinegar, cornmeal, and flour. These valuable items should not be overlooked but included in your survival food package. If these items can be found in your kitchen, they must also be present in your emergency food supply. Organize Based on Your Preference. Of course, every individual has his or her own way of organizing. You can group items together, like baking needs, snacks, breakfast, meat, vegetables, fruit, soup, etc. It doesn’t really matter as long as it’s organized to your taste and accessing them is easier for you. Be Ready for the Possibility of Electricity Loss. Some disasters and emergencies may lead to the loss of electricity. When this happens, you would not be able to see cans and other items clearly. To make sure that you can access your goods and food items at all times, you can include a number of flashlights to different shelves and baskets. It is also a great idea to add some manual can openers to your pantry. Also, never forget to let everyone living in your house know about the whereabouts of everting tool and food item. Through this, everyone can easily access drinks and foods every time they are needed by any member of the family. Also, do not hesitate to get additional storage when necessary. Due to a lot of items needed for just a single person, you might need to get extra cabinets and shelving to condense the space. Bear in mind that when it comes to an emergency food storage, organization is actually half the battle. Spend some time to organize your survival food package, and you’ll always be ready for any crisis or emergency. Knowing how to organize survival food is the key to having a sense of security and peace of mind. When disasters come along, you and your family can survive even when food shops and grocery stores are unavailable. These would be my tips on how to organize survival food supply. If you have any questions or suggestions then please leave them in the comment section below. Your feedback helps the community to prepare the smart way now so that we can thrive later. Thank you to Smart Prepper Gear Patreon Community for helping me to produce helpful blog posts, podcasts and videos!